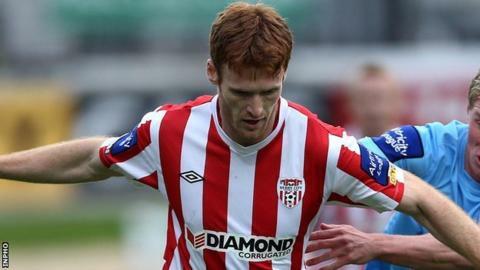 Derry City have just one win from their last seven league matches after losing to struggling UCD at the Brandywell. Patrick McEleney and Philip Lowry had chances for Derry, before Mark Langtry fired a superb strike from 25 yards into the top corner after 33 minutes. Substitute Sean Houston went close to equalising on several occasions, having a header saved by Conor O'Donnell and firing two efforts wide of the post. Houston also had the ball in the net but the flag was up for offside. Robbie Benson squandered a late chance to add to UCD's tally but Langtry's goal, his side's first in five games, proved enough for the Dubliners to secure their first victory since mid-July. The Candystripes were left to rue those early opportunities when McEleney fired over the bar and Lowry ran onto a pass from Rory Patterson, but his right-foot shot from the edge of the box flew wide of the right-hand post. A second consecutive home defeat sees Peter Hutton's side head to Bohemians for their final Premier Division game of the campaign next week hoping to avoid their worst league season since 2007. Derry have managed just nine league victories from 32 games and unless they can overcome Bohs, they will finish a season without reaching double figures in wins for the first time in seven years. After that match, the Brandywell club will focus their attention on the FAI Cup final against St Patrick's Athletic at the Aviva Stadium on 2 November. Derry drop to seventh in the table, with UCD one point ahead of Athlone Town at the basement.